I don’t know if you’ve heard, but a couple of years ago Levi released a pair of jeans that purposely gives you a wedgie. This goes against the natural way of things since most of us prefer to AVOID wedgies. But if Khloe Kardashian can make camel toes a thing, then maybe the wedgie can make a stand while giving your tush a little help as well. Let’s go over the pros and cons of this new trend. According to the testers at RealSimple, the jeans appear to follow a woman’s natural curves allowing for the flexibility preventing them from pushing your bottom into an unnatural shape. The presence of wide pockets on the back helps to create a round shape even if your tush tends to be on the flatter side. This is welcome news for those of us not endowed with the back assets. The editors of InStyle tested them with editors with tushes ranging from large and round to “non-existent” with each stated that indeed the Wedgie Fit Jeans does indeed deliver on their promise of a perfectly round tush. Or at least more there then before the jeans. Levi’s Wedgies are made of 100% cotton and deliver on their traditional commitment to high quality denim. The quality gives the jeans a bit of stiffness that helps them hold their shape, which is an advantage to them holding your tush in shape. Most jeans are being made with Lycra-infused material giving them the stretchy feel and aesthetic we’ve become used to feeling in our jeans, but this stretch has the disadvantage of not giving the support and shaping that these jeans seem to give. These jeans are definitely popular. Anthropologie’s website states that they are sold out and other style stores stock enthusiastically. Comments on Levi’s website show how enthusiastic customers are about these Wedgies, stating that the jeans make their bum look fabulous and round. 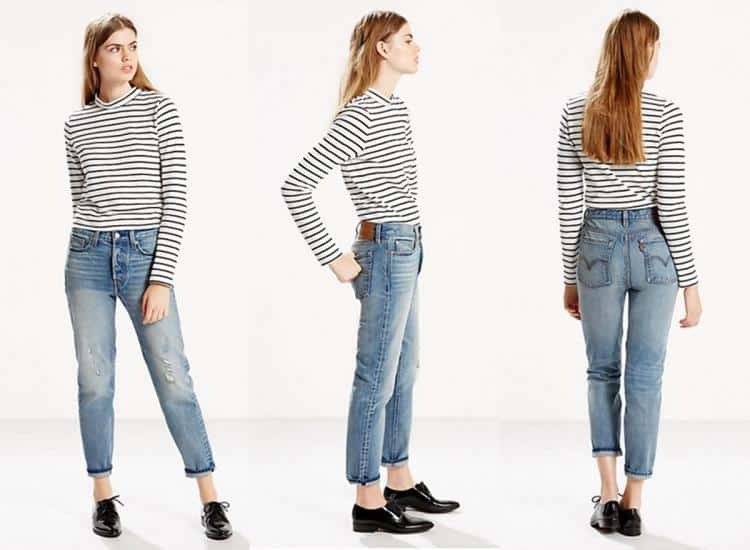 Giving the jeans 4 out of 5 stars, these jeans are one of the “It” jeans of the season. Levi’s wedgies seem to fit a diversity of women with bodies of all shapes and sizes. They are a modern take on classic jeans and don’t bunch up or bag out due to the high-quality cotton material. That is something to bow your hat to. One consistent complaint about the jeans from testers at both InStyle and RealSimple is the jeans fitting too snugly around the waist. As high-rise jeans, this can become a bit uncomfortable throughout the day. It also might have an effect on the sizing as the consensus is that perhaps it would be better to get a size up on the jeans so the fit can be a bit more comfortable around the waist. This could lead to you losing a bit of the shaping effect, but your bum might thank you. According to a BuzzFeed staffer at BuzzFeed, these jeans also do deliver on the wedgie promise. Stating that trying to sit felt like taking “a trip to hell and back” because of the affect on her lady bits. A practice lung brought on another line of fire. Here suggestion? Perhaps take breaks and give the area a breather throughout the day for those with larger assets to offset the wedgie effects on the area. While the snug fit helps the shaping effects of the jeans, as stated above, it also affects the mobility of the wearer. Most of the testers at InStyle agreed that they usually preferred high-rise, stretchy jeans that had a bit of grip and were not used to the stiffness of the wedgie jeans material. Most also agreed that they loved the overall effects of the jeans on their bottom and were surprised at how well it made their tush look. They also stated that the jeans did loosen throughout the day and relaxed with time. Overall, the jeans seemed to deliver on the promise for the perfect tush and had the women feeling “like a million bucks.” Though they are sold out on some sites you can find your pair on the Levi website.